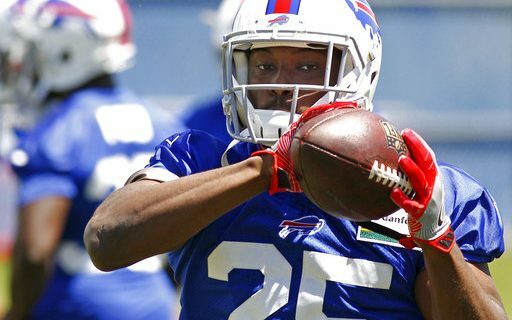 When we look at the Buffalo Bills running back corps for 2018 it starts with the great LeSean McCoy. As a general rule, running backs in the NFL have a short shelf life and if a club can get a player to his second contract it’s looked at as a bonus. McCoy is now going into his tenth NFL season and will be 30 years old and while he may not be quite as fast or explosive as he was when he was younger, he is still damn good and there is a lot of gas left in the tank. To date he has shown no signs of slowing down. McCoy isn’t the biggest guy but he has shown throughout his career that he knows how to take a hit and because of that he seldom gets worn down. He is not by any means a power but he can get yards after contact and is very elusive. As a receiver he is one of the better backs in football. Even at 30 years of age, McCoy is capable of going the distance on any given down. The Bills brass felt they needed a good and consistent complementary back to McCoy and they didn’t feel that player was on the roster a year ago. In free agency this year the Bills acquired Chris Ivory, who can be very good in the backup role. Ivory has more size and power than McCoy so he adds a bit of a different dimension to the Bills backfield. He has shown that he can easily run for 500 yards and 20 receptions in that limited role. The Bills will use a fullback in their offense and that person will be Patrick Demarco. DeMarco is a consistent lead blocker and is reliable as a receiver when used. He has the size to be able to also play as a move tight end in some formations. After McCoy and Ivory, the Bills will probably keep one or two other running backs. Those players will come from the group of Travaris Cadet, Taiwan Jones and rookie Keith Ford from Texas A&M. Jones has not done much as far as running back production since he has been in the NFL but he is a solid special teams performer. Cadet is an interesting guy in that he can be a good receiver out of the backfield. In 2016 while with New Orleans he had 40 receptions. He also had 38 catches back in 2014. Ford flashed while at Texas A&M as both a runner and a receiver. He is also a better than average kick returner. If he is to make the club he has to excel on special teams. Overall, the Bills has a good but not a great running back group. The key will be for McCoy to stay healthy. For the most part he has been able to do that his entire career but with this being his tenth season he could be on borrowed time. If he does sustain a long term injury, the Bills could be in trouble as they don’t really have a guy who can carry the load if McCoy isn’t around. Greg has already broken down the Bills receivers, tight ends, offensive line, defensive line and linebackers.